The filter curve can be easily adjusted similar to the Volume via a knob on the side. The built in 10W RMS amplifier provides a good signal evident even in noisy environments. In addition, the speaker still has a headphone jack. Included in the shipment is a 1.2m long connecting cable to the speaker jack of the readio, equipped with a 3.5mm phone plug, plus a power supply cable with fuses. The power requirements of the Desktop speaker is 12 to 18 VDC at max. 2,5A. With the equally included mounting bracket the loudspeaker can be mounted to the wall, when used on the desk the bracket can be removed. Built in is a powerful 10W RMS amplifier, which greatly helps in a car or another noisy environment. The large volume control sits conveniently on top of the case, just besides the other controls (push button, LEDs). At the side a 3.5mm phone socket offer connection for an additional loudspeaker or for headphones. A sleepmode helps to conserve power, an evermore important feature wether in the car or at home. With a single touch of the push button the DSPKR comes back to work... Protection circuits against overcurrent and wrong polarity assure an easy installation. Please note that this loadspeaker was designed for optimal voice audio reproduction, and is nit very well suitable for music. Loudspeaker NES-10-2 Mk3 with built-in DSP filter. These loudspeakers are suited for HF and VHF use to reduce static, background noise etc. The comprehensibility is greatly enhanced, fatigue when listening for extended periods is avoided. The model NES-10-2 allows for a variation of the DSP filter level in 8 steps (DIP switches on the rear of cabinet). 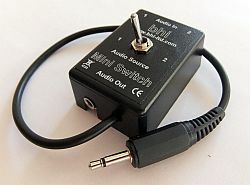 Additionally the model NES-10-2 offers a volume control, On/Off switch for the DSP function and a 3.5mm mini jack for connection of a headphone or an additional external speaker. Both models come with a 2m AF cable with 3.5mm mini plug (mono) and must be supplied with 12 to 28V DC, a DC cable is supplied. The supplied mounting bracket is helpful for installation in a car or at home. The new bhi Dual In-Line DSP noise eliminating module provides two channel/stereo noise cancellation, and is suitable for use on all radios and receivers including SDR, especially those with stereo or two channel output options. It can also be used with standard mono speaker input and output signals. The new Dual In-Line module incorporates bhi�s new dual DSP noise cancelling module, which has an improved noise cancelling algorithm that brings even better quality audio to the listener when operating in very noisy conditions. The processed speech is clearer and more intelligible as a result. The NEIM-Compact is a smaller module for noise reduction by bhi, which uses two internal "AA" size batteries or external DC power. With the battery operation this module is particularly suitable for mobile or portable operations during a vacation. The NEIM-COMPACT takes a stereo or two independant mono signals, the actual noise reduction is done with thewell known DSP system by bhi. The greatly enhances the intelligibility of voice modulation, and reduces fatigue induced due to long listening durations e.g. on shortwave. The NEIN-Compact module accepts either loudspeaker or line-out level input signals, on the output side a headphone or small loudspeaker can be connected. The operation is done very easy with two dial knobs for adjusting the volume and the filter levels. Due to the flexible design of input signals the module can be used with any type of radio or receiver, either classical or SDR type. The power supply is done either by two internal AA size alkaline or NiMH rechargeable batteries, or by supplying external 8 to 16V DC. Operating time with batteries is approx 40 hours, the device turns off automatically after one hour when not used. 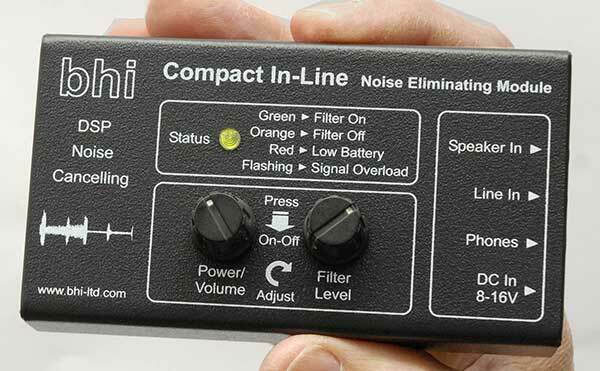 Take advantage of latest DSP technology also without the loudspeakers, with the NEIM-1031 DSP noise elimination module. Utilizing the same DSP technology as the above shown loudspeakers but has several connections for audio in- and output. With these connections the NEIM-1031 can be easily integrated into any existiing audio system. Stamp size PCB (30x38mm) for internal use in most radios. Uses the same DSP technology as the well known loudspeakers. The module is simply installed in the AF line. Potentiometers for input and output lines are provided for required adjustments to different rigs. A LED serves as a tuning aid. 4 different filter shapes (or none) are selectable with one button. This module is especially suitable for installation in the FT-817 transceiver. Due to it's small size it fits into the unit without sacrificing any space, say for the battery or similiar. The control button and LED are mounted in the upper cover of the FT-817. Installation in FT-817 ready for use available, please call. Radcom UK Review of the FT-817 DSP module NEDSP-1061. Copyright RSGB. Republished from RadCom with permission of RSGB. NEDSP1062 Amplified DSP Noise Eliminating PCB Module - This module incorporates an on board power amplifier and has an integral microcontroller connected to a small keyboard assembly. The microcontroller and keyboard provide single button operation of all the module's functions. The module can be retrofitted into the speaker path of extension speakers like the Kenwood SP31, Yaesu SP8 and Icom SP20/21/23, or used to 'revive' your old receiver/transceiver by fitting the module into the speaker path of your equipment (space permitting). The module is supplied with Generic Instructions, a fused DC power lead, fitting kit and specific fitting guides for the Kenwood SP31 and Yaesu SP8. Requires 12-18V, includes cable and fuse. New DSP module with amplifier, for integration into the loudspeaker cable. No mechanical work required, just plug it into the cable to the external speaker and supply with 12VDC. Reduces noise in all modes, eight filters selectable, integrated amplifier, DSP bypass function (Off), can be installed anywhere with Velcro™. 1 cable with 3,5mm connectors is included. The ANEM unit was developed as a result of feedback from potential customers of the NEDSP1062-KBD pcb module. These customers felt that they did do not have the skills, or didn't want to drill holes into their beloved extension speaker or radio to fit the NEDSP1062-KBD. As a result of some market research, we decided to fit the NEDSP1062-KBD pcb module into a small black compact ABS box, allowing these customers to put the unit close to, under, or even fix the ANEM to their speaker by means of velcro (supplied with the unit). It also complemented the fully featured bhi NEIM1031 in-line module because the ANEM has just two push button controls for all the DSP functions, and is more of a "plug and go" unit, whereas the NEIM1031 is more of a "plug and play" unit, with separate controls for all the functions. Small switchbox with 6 inputs (three of them terminated to 8 Ω) and one output (or vice versa). For connection of several radios to one DSP loudspeaker. Connections 3.5mm phono plug, includes 2 cables 120cm. Inputs: 2 x Mono 3.5mm Jack sockets. Output: 1 x 3.5mm mono jack socket & 1 x 3.5mm mono jack plug lead. Power handling: 3 Watts Maximum. Unused input is always terminated with a load to protect your audio outputs. Velcro pads are supplied to enable securing of the Mini Switch to your radio equipment.